The Kiss by Rodin, the kiss, Auguste rodin, rodin. 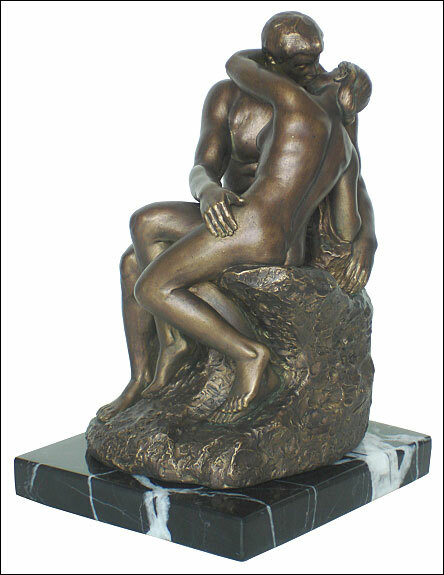 The passionate love of Francesca da Rimini and Paolo Malatesta was a theme which Rodin used to inspire The Kiss. Although it was originally intended to be part of the Gates of Hell, Rodin did not feel that it fit and removed the figures to make them an individual statue. Its blend of eroticism and idealism makes it one of the great images of sexual love. The form of the lovers emerges from the highlights and shadows of the statue. Light and shade were used by Rodin to create an impression of actuality. He did with modeling that which his contemporaries, the French impressionist painters, were doing with pigment. The couple are the adulterous lovers Paolo Malatesta and Francesca da Rimini, who were slain by Francesca�s outraged husband. They appear in Dante�s Inferno, which describes how their passion grew as they read the story of Lancelot and Guinevere together. Rodin indicated that his approach to sculpting women was of homage to them and their bodies, not just submitting to men but as full partners in ardor. The consequent eroticism in the sculpture made it controversial. Rodin considered it overly traditional, but it remains as one of his most famous works.